Background/Aim: Homeobox D4 (HOXD4) belongs to the homeobox (HOX) family, which plays a crucial role in the early embryo development and cell differentiation. The role of HOXD4 in human gastric adenocarcinoma has not been elucidated. 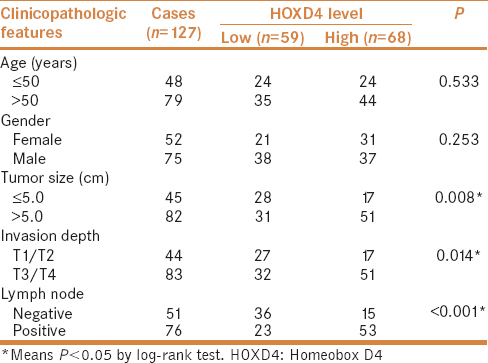 In the present study, we aimed to examine the expression levels of HOXD4 and dissect whether the HOXD4 expression is associated with aggressive clinicopathological outcomes of patients with gastric adenocarcinoma. Patients and Methods: Clinicopathological analyses were performed in 127 patients with gastric adenocarcinoma. Expression of HOXD4 was tested by immunohistochemistry staining and quantitative RT-PCR. Clinical outcomes were evaluated by the Kaplan–Meier method and log-rank test. The prognostic role of HOXD4 in gastric adenocarcinoma patients was assessed by univariate and multivariate analyses. The effects and mechanisms of HOXD4 on cell proliferation, migration and invasion were explored through cellular experiments. Results: HOXD4 expression was elevated in gastric adenocarcinoma tissues compared to non-tumorous gastric tissues (P = 0.018). High expression of HOXD4 was significantly associated with larger tumor size (P = 0.008), advanced tumor invasion depth (P = 0.014), and positive lymph node metastasis (P < 0.001). Moreover, patients with high HOXD4 expression had poorer overall survival (P = 0.001), and HOXD4 was identified as an independent prognosis factor according to multivariate analysis [hazard ratio (HR) =2.253, 95% confident interval (CI) 1.028–4.979, P = 0.044]. Cellular results revealed that HOXD4 can promote tumor cell proliferation by upregulating c-Myc and cyclin D1. Conclusions: Our study demonstrated that overexpression of HOXD4 was significantly correlated with poorer prognosis of gastric adenocarcinoma patients, indicating the potential of HOXD4 as a novel clinical predictive biomarker and drug target. Gastric adenocarcinoma comprises 90% of cancers that occur in stomach and it is recognized as the second most common cancer all over the world., Approximately 95% of gastric adenocarcinomas are malignant types and contribute to the majority of cancer-related deaths. Current gastric adenocarcinoma therapies include surgical resection, adjuvant chemotherapy, and radiotherapy. Despite the advances in therapies that have been achieved over the past three decades, patients with unresectable gastric cancer have a very poor prognosis, and the 5-year overall survival ranges from 8% to 20%. Therefore, there is an urgent need to explore the progression and metastatic mechanism of gastric adenocarcinoma and identify novel prognostic biomarkers for more effective postoperative follow-up, as well as developing new therapeutic targets. The homeobox (HOX) proteins play crucial roles in the early development of embryos and organs. They are involved in the development of vertebrae, external genitalia, gastrointestinal tract and central nervous system. Moreover, HOX proteins can regulate the proliferation and differentiation capacities of hematopoietic cells. Aberrant high expression of HOX gene was reported to be associated with the pathogenesis of leukemia. The HOX proteins can be divided into four similar clusters, namely HOXA, HOXB, HOXC, and HOXD. The role of HOXD proteins on upregulating proliferation and differentiation of neuroblastoma cells has been previously reported. Accumulating evidence shows that high HOXD expression is related to the progression of diverse types of human tumors, such as prostate cancer, osteosarcoma, gastric cancer and bladder cancer., As a member of the HOXD cluster genes, homeobox D4 (HOXD4) is located on human chromosome 2q31.1 and is differentially expressed with high tissue specificity. Endogenous HOXD4 protein expression has been detected in brain, heart, lung, small intestine and spinal cord. Therefore, it has been well acknowledged that HOXD4 plays an important role in the early mammalian development. Interestingly, recent evidence revealed that HOXD4 was widely expressed in glioma tissues and showed potential effects on promoting glioma progression. In addition, the expression pattern of HOXD4 was consistent with the oncogenic characteristics in a mice model for breast cancer. However, the role of HOXD4 in the progression of human gastric adenocarcinoma has not been identified up to now. In the current study, we first examined the protein and RNA levels of HOXD4 in gastric adenocarcinoma tissues and adjacent non-tumorous gastric tissues. Since we identified a positive correlation between high HOXD4 level and lymph node metastasis of gastric adenocarcinoma patients, we next conducted statistical analyses and cellular experiments to further explore the potential underlying mechanisms and clinical significance of HOXD4 in gastric adenocarcinoma. This study was approved by the Ethic Committee of Yidu Central Hospital of Weifang and written informed consent was obtained from all participants. Seventeen pairs of resected gastric adenocarcinoma samples and adjacent non-tumorous gastric tissues were obtained from the Department of Surgery, which were fresh-frozen with liquid nitrogen for further RNA analysis. Besides, we randomly selected 127 patients with gastric adenocarcinoma from Yidu Central Hospital of Weifang. All these patients underwent surgical resection during May 2007–February 2016. For all enrolled patients, we collected their formalin-fixed paraffin-embedded (FFPE) gastric adenocarcinoma tissues and matched adjacent stomach tissues. Only patients who survived more than 12 months after surgery were enrolled and the median survival time was 53 months. All enrolled patients were followed up until death or the end of our study (March 2017), ranging from 15 to 84 months. At the end of the follow-up period, a total of 51 patients had succumbed to gastric adenocarcinoma. All the specimens used in the present study were confirmed by histological examination. We classified patients into T1–T4 based on the AJCC TNM tumor staging system. Immunohistochemistry (IHC) staining for HOXD4 was carried out by using the standard protocol as described by others. Briefly, 6 μm serial sections were dried at 70°C and then deparaffinized with xylene and rehydrated in alcohol. The microwave antigen retrieval was carried out in pH 6.0 citrate buffer. Subsequently, specimens were incubated with the rabbit antihuman HOXD4 antibody (1:1000 dilution; Cat. No. PA5-64441; Invitrogen, Carlsbad, USA) overnight. On the next day, the slide sections were washed, and their immunoreactivities were visualized by using poly-horseradish peroxidase-conjugated immunoglobulin G (HRP IgG) and 3,3′-diaminobenzidine substrates. Primary antibody was replaced with phosphate-buffered saline as the negative control. The stained slides were examined and scored by two independent investigators at a 400× magnification, and six fields of each section were randomly selected. Staining intensity was divided into four grades as follows: 1 (negative), 2 (weak), 3 (moderate), and 4 (strong). The average staining percentage was scored as follows: 1 (<25%), 2 (25–50%), 3 (51–75%), and 4 (>75%). The IHC score was finally determined by multiplying the intensity score by the staining percentage score. To better evaluate the clinical significance of HOXD4 in gastric adenocarcinoma, patients were divided into high-HOXD4 expression group (IHC score ≥7, n = 68) and low-HOXD4 expression group (IHC score <7, n = 59) according to the cutoff value determined by receiver operating characteristic (ROC) curve. We obtained three cell lines from ATCC. GES-1 was the normal gastric epithelial cell line, while both AGS and MKN1 cell lines were generated from human gastric adenocarcinoma. All cells were cultured in RPMI 1640 medium supplemented with 10% fetal bovine serum and 1% penicillin-streptomycin. Cells were maintained at 37°C in a humidified atmosphere with 5% CO2. The HOXD4 overexpressing plasmid and silencing siRNA (5′-GCCAGCAUUUACAGCCGAUTT-3′) were purchased from Sangon Biotech (Shanghai, China). Cell transfection was performed using Lipofectamine3000 (Invitrogen, USA) according to the manufacturer's instructions. After 24–48 h, transfected cells were partially harvested to test the transfection efficiency, and the other cells were passaged and subjected to phenotype and mechanism assays. Harvested cells were lysed by NP40 lysis buffer (Beyotime Biotechnology, China) at 4°C for 2 h, and the proteins were obtained by centrifugation at 12,000 rpm for 10 min to collect the supernatant. After protein quantification, 20 μg proteins from each group were resolved by 12% sodium dodecyl sulfate polyacrylamide gels electrophoresis (SDS-PAGE). Proteins were then transferred onto polyvinyldifluoride membranes (Millipore, USA) and blocked with 5% BSA for 1 h at room temperature. The primary antibodies used for overnight incubation included anti-HOXD4 (PA5-64441, Invitrogen), anti-c-Myc (MA1-980, Invitrogen), anti-cyclin D1 (no. 2922, Cell Signaling Technology), and anti-GAPDH (sc-47724, Santa Cruz Biotechnology) antibodies. After further incubation with corresponding secondary antibodies, the detection of immunoreactivity was performed by using enhanced chemiluminescence and X-ray film. MTT (3-(4,5-dimethylthiazol-2-yl)-2,5-diphenyltetrazolium bromide) assay was performed to examine cell proliferation. Briefly, 3 × 103 cells were seeded into 96-well plates and cultured for different days. At the end of different time points, 100 μl MTT solution was added to each well and incubated at 37°C for 4 h. Then, the medium was replaced with 200 μl DMSO and shaken at room temperature to resolve the crystals. The absorbance was measured at 590 nm wavelength by the automated plate reader. The migration was assessed by the wound-healing assay. Transfected cells were cultured to 80–90% confluency in the 6-well plates and then scratched with sterilized 200 μl pipette tips. The width of wound was measured at designated time points and normalized to the control group. Transwell assay was performed to measure cell invasion. Briefly, transfected tumor cells were added to the upper chamber and allowed for invasion in 37°C. After 48 h, invaded cells in the lower surface of membrane were counted. For each well, cell counting was performed in 10 randomly selected fields. All the experiments were repeated three times. Statistical analyses were conducted by using the SPSS version 20.0 (IBM, New York, NY, USA). The association between the HOXD4 expression and clinicopathologic features was analyzed by Chi-square test. The overall survival curves of gastric adenocarcinoma patients were plotted using the Kaplan–Meier method. Statistical validation of independent prognostic factors was tested with multivariate analysis. Student's t-test was applied to analyze the results of cell experiments. P < 0.05 was considered statistically significant. The baseline characteristics of enrolled patients are shown in [Table 1]. The median age at the time of diagnosis was 54 years (range 38 to 71 years old). There were 52 females (40.9%) and 75 males (59.1%). Among them, 45 patients (35.4%) had a tumor size larger than 5 cm in diameter, and the other 82 patients (64.6%) had smaller tumor size. In our cohort, 44 patients (34.6%) were classified as T1–T2, and the other 83 patients (65.4%) as T3–T4 stages. There were 76 patients (59.8%) diagnosed with positive lymph nodes by the time of primary surgical resection, and the other 51 patients (40.2%) with negative lymph nodes. 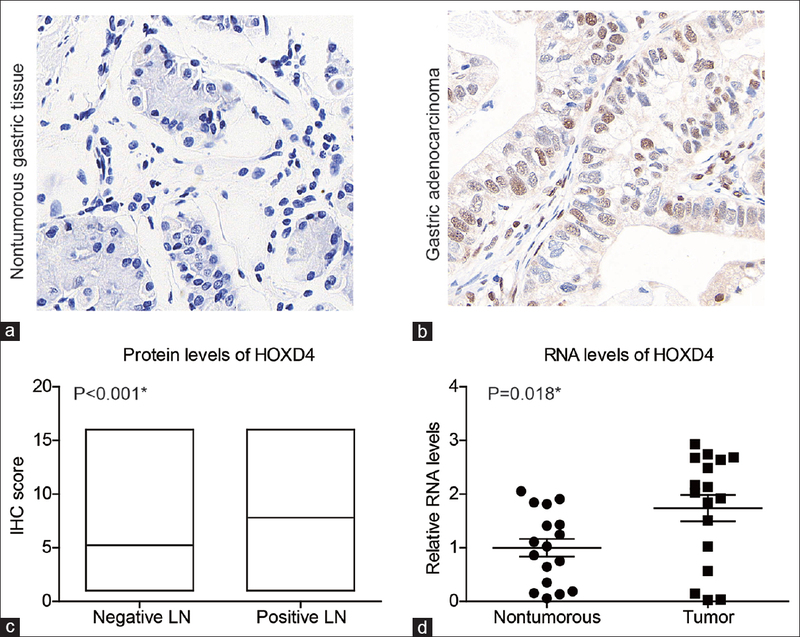 To investigate the role of HOXD4 in gastric adenocarcinoma, we first examined its expression patterns in tumor tissues and matched adjacent tissues by IHC staining and identified the nucleus localization of HOXD4 protein [Figure 1]a and [Figure 1]b. The median IHC score for adjacent non-tumorous gastric tissues was 4, ranging from 1–12. In contrast, the median IHC score for tumor tissues was 8, ranging from 1–16. Therefore, IHC data revealed that HOXD4 was lowly expressed in non-tumorous gastric tissues, but significantly elevated in gastric adenocarcinoma tissues (P < 0.001). In particular, patients with positive lymph node metastases also showed higher HOXD4 expression levels than those with negative lymph nodes (P < 0.001) [Figure 1]c. Furthermore, we measured the RNA levels of HOXD4 in another 17 pairs of flash frozen gastric adenocarcinoma tissues and adjacent tissues by RT-qPCR assays. The HOXD4 RNA level was also higher in tumor tissues than that in non-tumorous tissues [Figure 1]d (P = 0.018). Taken together, these results suggested that the HOXD4 was highly expressed in tumor tissues and may be involved in gastric adenocarcinoma development. 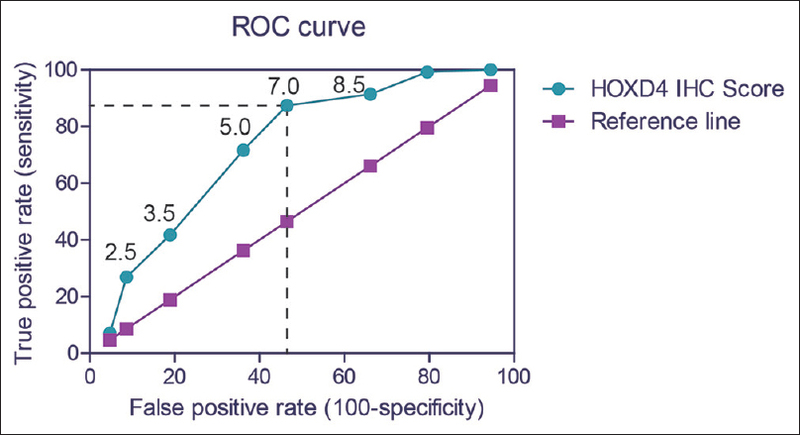 To better investigate the predictive role of HOXD4 in clinical application, we next plotted the ROC curve according to the IHC scores of 127 tumor tissues and adjacent non-tumorous tissues [Figure 2]. Briefly, IHC score 7.0 was indicated as a proper cutoff value with the highest Youden index (calculated as “sensitivity + specificity − 1”). Accordingly, 59 patients were grouped into low HOXD4 expression group (IHC score <7), and the other 68 patients were classified into high HOXD4 expression (IHC score ≥7) group. Subsequently, we tested the correlation of HOXD4 expression with the clinicopathological features in gastric adenocarcinoma patients [Table 1]. We found that the higher level of HOXD4 expression significantly correlated with larger tumor size (P = 0.008) and advanced invasion depth (P = 0.014). In contrast, no significant correlation was identified between HOXD4 expression and patients' age or gender (P > 0.05). The role of tissue HOXD4 expression in the overall survival of gastric adenocarcinoma patients was tested by Kaplan–Meier analysis and compared by the log-rank test. 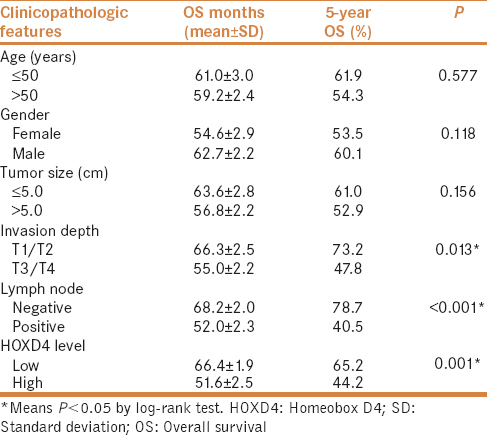 Gastric adenocarcinoma patients who expressed high protein levels of HOXD4 had a poorer mean overall survival time (51.6 ± 2.5 months) compared to those with low expression levels of HOXD4 (66.4 ± 1.9 months; P = 0.001) [Table 2]. Similarly, the median survival time in HOXD4 high expression group was 59.0 ± 4.9 months, which was significantly shorter than those with low HOXD4 expression (76.0 ± 6.5 months). Well-known conventional prognostic factors were also found to be associated with the patients' overall survival. 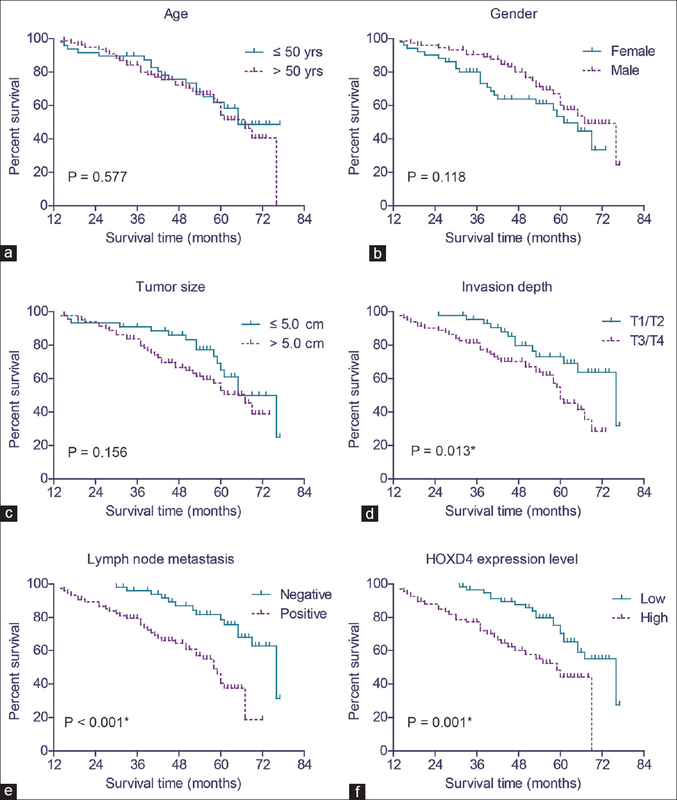 For example, advanced tumor invasion depth (P = 0.013) and positive lymph node metastasis (P < 0.001) [Figure 3] and [Table 2] can both indicate poorer clinical outcomes. In addition, we conducted multivariate analysis using a Cox hazard regression model to test their independent effects on patients' overall survival [Table 3]. HOXD4 expression was an independent prognostic factor (HR = 2.253, 95% CI = 1.028–4.979, P = 0.044). In addition, positive lymph node metastasis (P < 0.05) was another independent factor of decreased overall survival (HR = 2.464, 95% CI = 1.049–5.786, P = 0.038). We performed cellular experiments to test the function of HOXD4 in gastric adenocarcinoma. The expression patterns of HOXD4 in non-tumorous gastric cells (GES-1) and gastric adenocarcinoma cells (AGS, MKN1) were examined by Western blot [Figure 4]a. We found that HOXD4 expression was higher in AGS cells and MKN1 cells than that in GES-1 cells. Then, we knocked-down or overexpressed the HOXD4 in AGS and MKN1 cells [Figure 4]b. Western blot showed that HOXD4 overexpression significantly upregulated the protein levels of c-Myc and cyclin D1 oncoproteins. In contrast, silencing HOXD4 attenuated the protein expression of c-Myc and cyclin D1. Since HOXD4 plays critical roles in regulating protein transcription, we next tested whether the protein level alteration of c-Myc and cyclin D1 was caused by the transcription inhibition. RT-qPCR results revealed that the RNA levels of c-Myc and cyclin D1 were both positively regulated by the HOXD4 expression [Figure 4]c.
Furthermore, we tested the transfected cell characteristics to investigate the role of HOXD4 in tumor progression, and the results revealed that HOXD4 overexpression could enhance the proliferation, migration, and invasion capacities of AGS cells and MKN1 cells [Figure 4]d-f]. Consistently, silencing HOXD4 inhibited the cell proliferation and invasion capacities. These data suggested that HOXD4 may play significant roles in the progression of human gastric adenocarcinoma. The HOX (homeobox) gene, which is about 180-bps sequence, encodes a protein domain containing 60 amino acids called homeodomain. The homeodomain combines with various specific DNA and thus regulates the different expression of downstream genes. Recently, increasing evidence shows that HOX gene may play a crucial role in regulating the progression of various tumor types. It was reported that the expression of HOX gene clusters was upregulated in leukemia. Further studies demonstrated that HOX gene was critically related to the formation of myeloid phenotype. Similarly, overexpression of HOX gene clusters caused a dramatic progression of breast cancer in a mice model, suggesting the functional role of HOX gene on promoting breast cancer development. In addition, it has been found that expression of HOXD1 and HOXD12 was elevated in human glioma tissues, whereas HOXD3 expression was downregulated, indicating the distinct functions of HOXD proteins. HOXD9 could also upregulate the migration and proliferation capacities of glioma cells and simultaneously inhibit tumor cell apoptosis. 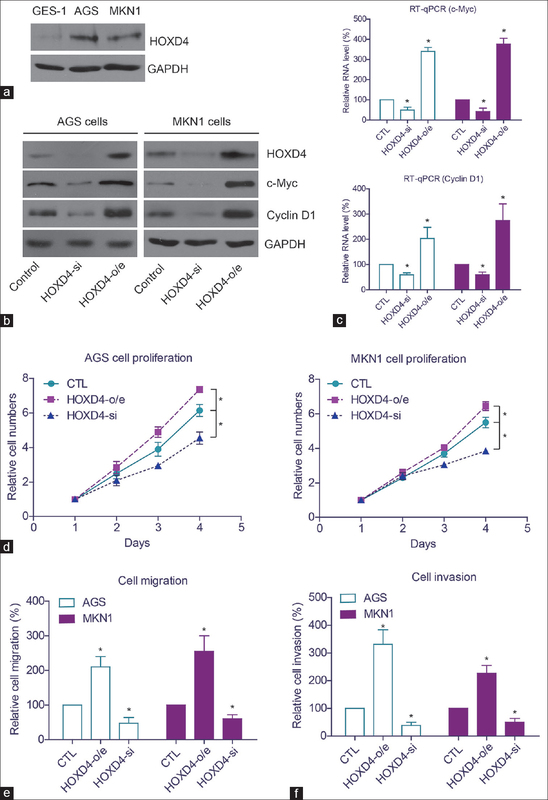 Moreover, HOXD9 was identified to be enriched in glioma cancer stem-like cells, further emphasizing its potential as a novel therapy target. However, the underlying functions of HOXD4 in gastric adenocarcinoma have not been elucidated up to now. In our present study, we found that HOXD4 expression was upregulated in gastric adenocarcinoma tissues compared to that in adjacent non-tumorous gastric tissues by IHC staining and quantitative RT-PCR analyses. The expression patterns of HOXD4 in patients with or without lymph node metastasis were also compared, and the results indicated the role of HOXD4 in promoting the metastatic process of gastric adenocarcinoma. Furthermore, we analyzed the correlations between HOXD4 expression and clinicopathologic features of enrolled patients. The higher level of HOXD4 expression was significantly correlated with large tumor size, advanced tumor invasion depth, and positive lymph node metastasis. In addition, multivariate analysis identified higher HOXD4 expression as an independent unfavorable prognosis factor for gastric adenocarcinoma patients. Furthermore, we conducted cellular experiments and found that HOXD4 expression significantly promoted the proliferation, migration, and invasion capacities of gastric adenocarcinoma cell. Taken together, our data suggest that the upregulated HOXD4 expression is related to poor clinical outcomes of gastric adenocarcinoma patients, possibly by promoting the proliferation and metastasis of tumor cells. Consistent with our findings, it has been previously reported that HOXD4 expression was significantly elevated in glioblastoma multiforme patients and closely correlated with the poor clinicopathological outcomes of those patients. It was also found that HOXD4 could upregulate the proliferation and differentiation capacities of neuroblastoma cells. Moreover, the HOXD4 was identified as a potential oncoprotein when investigating its in vivo role by using tumor-bearing mice models. Therefore, the aberrant high expression of HOXD4 protein is significantly related to the pathogenesis of malignancy, and further studies focusing on exploring its underlying mechanisms will be invaluable for potential clinical applications. Our study demonstrated that the expression level of HOXD4 was significantly elevated in gastric adenocarcinoma tissues and closely related to the aggressive phenotypes of gastric adenocarcinoma. Furthermore, HOXD4 was identified as a potential independent prognostic factor by univariate and multivariate analyses. Our data thus provided initial evidence for it serving as a novel prognostic biomarker in gastric adenocarcinoma and would be helpful for clinical prediction and personal treatment improvement. Chen WM, Chen WD, Jiang XM, Jia XF, Wang HM, Zhang QJ, et al. HOX transcript antisense intergenic RNA represses E-cadherin expression by binding to EZH2 in gastric cancer. World J Gastroenterol 2017;23:6100-10. Xu Y, Yang X, Li Z, Li S, Guo S, Ismail S, et al. Sprouty2 correlates with favorable prognosis of gastric adenocarcinoma via suppressing FGFR2-induced ERK phosphorylation and cancer progression. Oncotarget 2017;8:4888-900. Agrawal K, Alfonso F. A rare association of autoimmune hemolytic anemia with gastric adenocarcinoma. Case Rep Oncol Med 2017;2017:8414602. Kirgiz A, Karaman Erdur S, Kaldirim H, Atalay K, Kocabora MS. Subhyaloid hemorrhage as the first presenting sign of gastric adenocarcinoma. J Fr Ophtalmol 2018;41:e41-2. Zhao XW, Zhan YB, Bao JJ, Zhou JQ, Zhang FJ, Bin Y, et al. Clinicopathological analysis of HOXD4 expression in diffuse gliomas and its correlation with IDH mutations and 1p/19q co-deletion. Oncotarget 2017;8:115657-66. Copur Ö, Müller J. Histone demethylase activity of utx is essential for viability and regulation of HOX gene expression in Drosophila. Genetics 2018;208:633-7. Kontro M, Kumar A, Majumder MM, Eldfors S, Parsons A, Pemovska T, et al. HOX gene expression predicts response to BCL-2 inhibition in acute myeloid leukemia. Leukemia 2017;31:301-9. Zha Y, Ding E, Yang L, Mao L, Wang X, McCarthy BA, et al. Functional dissection of HOXD cluster genes in regulation of neuroblastoma cell proliferation and differentiation. PLoS One 2012;7:e40728. Joo MK, Park JJ, Chun HJ. Impact of homeobox genes in gastrointestinal cancer. World J Gastroenterol 2016;22:8247-56. Zhang H, He JW, Gao G, Yue H, Yu JB, Hu WW, et al. Polymorphisms in the HOXD4 gene are not associated with peak bone mineral density in Chinese nuclear families. Acta Pharmacol Sin 2010;31:977-83. Wang L, Zhao Y, Qin Y, Xuan Y, Qiu T, Fu B, et al. High expression of long non-coding HOX antisense transcript RNA and its clinical significance in cancer tissues: A meta-analysis. Thorac Cancer 2017;8:387-92. Zhang F, Nagy Kovács E, Featherstone MS. Murine hoxd4 expression in the CNS requires multiple elements including a retinoic acid response element. Mech Dev 2000;96:79-89. Amin MB, Greene FL, Edge SB, Compton CC, Gershenwald JE, Brookland RK, et al. The eighth edition AJCC cancer staging manual: Continuing to build a bridge from a population-based to a more “personalized” approach to cancer staging. CA Cancer J Clin 2017;67:93-9. Hou S, Du P, Wang P, Wang C, Liu P, Liu H, et al. Significance of MNK1 in prognostic prediction and chemotherapy development of epithelial ovarian cancer. Clin Transl Oncol 2017;19:1107-16. Li H, Xiao N, Li Z, Wang Q. Expression of inorganic pyrophosphatase (PPA1) correlates with poor prognosis of epithelial ovarian cancer. Tohoku J Exp Med 2017;241:165-73. Tan W, Pan M, Liu H, Tian H, Ye Q, Liu H, et al. Ergosterol peroxide inhibits ovarian cancer cell growth through multiple pathways. Onco Targets Ther 2017;10:3467-74. Liu H, Zhang Q, Li K, Gong Z, Liu Z, Xu Y, et al. Prognostic significance of USP33 in advanced colorectal cancer patients: New insights into β-arrestin-dependent ERK signaling. Oncotarget 2016;7:81223-40. Zhang Q, Fan H, Zou Q, Liu H, Wan B, Zhu S, et al. TEAD4 exerts pro-metastatic effects and is negatively regulated by miR6839-3p in lung adenocarcinoma progression. J Cell Mol Med 2018;22:3560-71. Liedtke S, Sacchetti B, Laitinen A, Donsante S, Klöckers R, Laitinen S, et al. Low oxygen tension reveals distinct HOX codes in human cord blood-derived stromal cells associated with specific endochondral ossification capacities in vitro and in vivo. J Tissue Eng Regen Med 2017;11:2725-36. Mallo M. Reassessing the role of hox genes during vertebrate development and evolution. Trends Genet 2018;34:209-17. Morgan R, El-Tanani M, Hunter KD, Harrington KJ, Pandha HS. Targeting HOX/PBX dimers in cancer. Oncotarget 2017;8:32322-31. Böhmer C, Werneburg I. Deep time perspective on turtle neck evolution: Chasing the hox code by vertebral morphology. Sci Rep 2017;7:8939. Gonzalez P, Uhlinger KR, Lowe CJ. The adult body plan of indirect developing hemichordates develops by adding a hox-patterned trunk to an anterior larval territory. Curr Biol 2017;27:87-95. Morrison A, Ariza-McNaughton L, Gould A, Featherstone M, Krumlauf R. HOXD4 and regulation of the group 4 paralog genes. Development 1997;124:3135-46. Moroni MC, Viganó MA, Mavilio F. Regulation of the human HOXD4 gene by retinoids. Mech Dev 1993;44:139-54. Ogura Y, Miyake N, Kou I, Iida A, Nakajima M, Takeda K, et al. Identification of HOXD4 mutations in spinal extradural arachnoid cyst. PLoS One 2015;10:e0142126.